Great Ottoman for the price! Arrived just as pictured no issues. 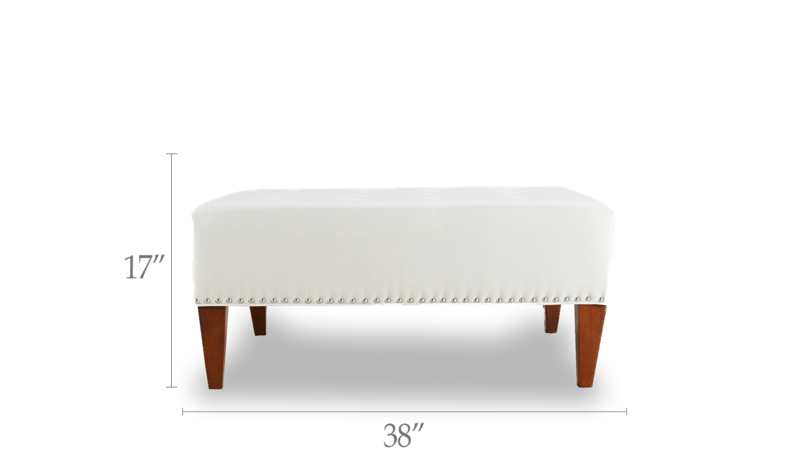 I am almost in love with this ottoman. I would've rated 5 stars had the legs been espresso as noted in the description; they're actually closer to red oak (noticeably different). Didn't feel like taking on any projects but I'll have to stain the legs. Otherwise, the fabric is wonderful and this piece is large (it pays to take note of the dimensions!). Assembly was a breeze and ottoman was packed well. Pretty happy with this purchase! OBSESSED with this ottoman! Very easy to assemble, you just screw the legs on! Looks super expensive for being so affordable. The fabric is beautiful and durable. However, perhaps in oversight, I missed that the nail heads were silver instead of gold. As pictured, I thought they were going to be gold. Nonetheless, I kept it because it was perfect for my living room. Added the finishing touch to our new apartment that we needed. We use it as a table, added a decorative tray and BAM! Perfection! Beautifully made ottoman, it looks stunning! I love it! The white linen is a little difficult to keep clean, but I knew this before purchasing. The piece holds the weight of a table tray with candles and also the weight on my toddler who often climbs on top.